A special photo mosaic of some of our adopted pets over the past 5 years! In March of this year, the Petco Foundation decided to put together an enormous mosaic of adopted pets, reaching out to shelters and rescues to encourage their adopters to share photos and stories of their furry family members to add to their huge photo mosaic. 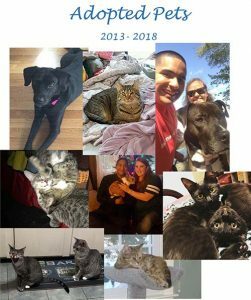 So, we sent out an email to our adopters from the past five years to see if they would be willing to submit their photos and also send us a photo so that we could share it with all of our adopters, volunteers, and staff members! We were so thrilled with the amount of people who shared their beautiful photos with us. We have had so, so many special adoptions over the past five years (and even more in the years before that!) and were so happy to receive updates from some of our Sanctuary and rehoming pets. From Lucy the dog who spent nearly four years at our Sanctuary to Filmore the cat who went home with one of our awesome volunteers just weeks after joining our living room kitties, each and every one of our adoptions holds a very special place in our hearts. 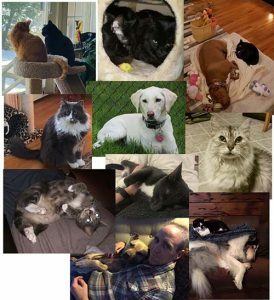 Although this is just a small portion of our adopted pets, we want to share these photos with all of you to show you how happy our amazing adopters have made so many of these wonderful pets. We so appreciate our adopters, volunteers, and donors who make all of this and more possible each and every day! Thank you for all that you do.